Comics fans might best know Greg Pak and Takeshi Miyazawa as the creators of Amadeus Cho—one of the smartest heroes in the Marvel universe, and as the Totally Awesome Hulk, one of its most prominent Asian American superheroes. Now the duo are back together for a new series, and a new Asian hero to welcome into the fold. For Boom Studios’ new four-part miniseries Mech Cadet Yu, longtime collaborators Greg Pak and Takeshi Miyazawa are reunited alongside colorist Triona Farrell and letterer Simon Bowland to tell the tale of Stanford Yu—a young boy working alongside his father as a janitor at a high-tech academy for pilots destined to bond with a group of interstellar mecha who’ve come to Earth to help defend it from an impending alien invasion. Naturally, hijinks ensue, and suddenly Stanford finds himself building a surprising rapport with a mech that’s chosen to bond with him instead of one of the myriad highly trained kids at his academy. Aside from being a story about giant robots beating the snot out of equally giant aliens, Mech Cadet Yu—inspired by a story Pak and Miyazawa originally wrote for a short anthology series revolving around Asian heroes in genre fiction—is a story about underdogs and finding a place in the world around you, even if that place is outside of the station that society originally pegged you for. Check out our interview with Pak below, as well as a preview of the first issue, which sees Stanford encounter his future robot partner for the first time. io9: What can you tell us about Stanford Yu and where we find him at the start of Mech Cadet Yu? 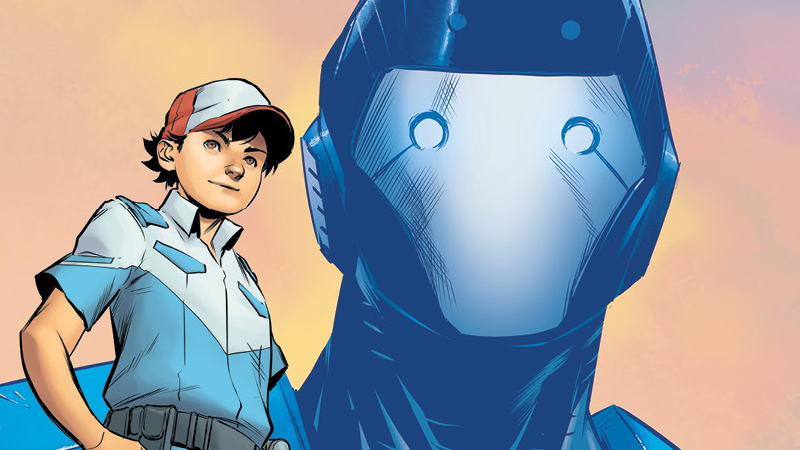 Greg Pak: Stanford Yu is our underdog hero, a janitor’s kid who works at the Sky Corps Academy in Los Robos, Arizona. He’s got it coming and going—the elite kids sneer at him and his mom scolds him for feeling sorry for himself. He knows he’s at the bottom of the hierarchy at this elite school, with zero chance to be one of the chosen kids who bond with a giant robot when the mechs arrive once every four years. But he’s a fixer with a heart of gold, always ready to scrounge and repair things rather than throw them away. And when he meets a giant robot who’s something of an underdog himself, suddenly anything becomes possible. io9: Mech Cadet Yu has history in a past collaboration of yours and Takeshi’s, the “Los Robos, Arizona” story you worked on for Shattered. What inspired the two of you to return to this story, and why now? Pak: We always knew we wanted to tell a bigger story—I’ve got an outline with at least 12 issues of material. And then during one convention a couple years ago, Boom Studios editor Cameron Chittock introduced himself and asked if I had anything that might be a fit. I pitched him the story as “Harry Potter meets Pacific Rim,” and his eyes just lit up. And here we are! io9: What do you think it is about the idea of giant robots that makes them such a compelling idea for science fiction? Pak: As a kid, I loved any story in which a kid made friends with some kind of animal or monster. I think there’s something hugely compelling about that situation for a kid. Kids are small and relatively weak, and their encounters with adults and other kids are often fraught with violence or threats of violence. So, I think there’s something really powerful for kids about this fantasy of making friends with something that’s very, very strong. And what’s stronger than a 40-foot-tall giant robot? io9: Would you say Mech Cadet Yu is inspired by any particular take on giant robots, or did you intentionally want to tell a story that subverted the sort of mecha stories people are familiar with? Pak: I wrote and directed a movie called Robot Stories about 15 years ago that was made up of four different short stories about love, death, family, and robots. I’ve had different stories with all different kinds of robots and artificial intelligence in my head for years. With Mech Cadet Yu, I wasn’t setting out to pay homage to or subvert anything, necessarily. I just had this idea of a story that’s almost a kind of fable, in which mysterious giant robots from outer space descend upon a specific spot in the desert to bond with kids. And then the idea came into my head that the military would want to get in on this and control it, so they build a military academy on the site to prepare kids for this bonding process. And then of course there would be alien monsters that our heroes would eventually have to fight, and the world came together from there. io9: The link between a pilot and their mecha is often a key part of these giant robot tales. What can you tell us about how Stanford bonds with his robot companion in the series? Pak: I don’t want to spoil too much, but Stanford and his robot are both underdogs. When you read the first issue, I think it’ll be clear why they were meant for each other. io9: You’ve described the series in the past as being mostly set in a world like our own... with giant robots and space aliens as the added twist. What drew you to that clash of the weird and ordinary for this story, instead of leaning into the scifi elements more? Pak: The emotional core of this story is this scrappy, underdog kid fighting to find a place in this elite academy that doesn’t really seem to want him. That struggle of a young person to find a place where he can belong and serve felt like a very real, very universal story, and I wanted to make that feel as real and honest as possible. From the beginning, I always saw it as happening in a world very much like our own where just about everything would be recognizable except the giant robots themselves. That just felt like the best way to get the most emotional impact possible. I’m also a big fan of taking one simple idea and seeing how it changes the world rather than cramming too many elements into a story and changing up everything just for the heck of it. As a writer, one of my vices is having too many ideas—I wanted to try out everything. But with Mech Cadet Yu I tried to be disciplined and stay focused and really explore how the world would change with just this one big difference. io9: What’s it been like collaborating with Takeshi again for this series? I would imagine you’re a well-oiled partnership at this point given your past work. Pak: Oh, man, I absolutely love working with Tak. He reads me like a book and I just love all the emotional nuance and sheer fun he brings to every panel and every page. He’s also so, so good at drawing everyday people—particularly young people—and making them feel three dimensional, emotionally complex, and incredibly relatable. And he absolutely loves giant robots. I never thought of doing this book with anyone but him. I’d also love to plug colorist Triona Farrell and letterer Simon Bowland, who are doing beautiful work on the series, and our editors Cameron Chittock and Eric Harburn, who are helping us make the book as good as it possibly can be. io9: Speaking of your previous collaborations, our readers probably know you both as the creators of Amadeus Cho over at Marvel, who’s become one of their most prominent Asian American characters lately. Having created another Asian American hero in Stanford, what are your thoughts on the state of Asian American representation in comics at the moment? How important was it to you to further that representation in Mech Cadet Yu? Pak: I grew up at a time when there were only the barest handful of non-stereotypical Asian American characters in mainstream television shows, movies, or comics. So ever since my earliest short films in the 1990s as an NYU film student, I’ve done my best to cast all my films and books diversely—with a certain special interest in getting Asian American characters out into the world. Folks would sometimes ask me why I’d cast certain films with Asian American actors, and I’d honestly say it was because that’s the way the story came into my head, so why not cast it that way? I’m hugely proud to have co-created Amadeus with Tak back in the day and am thrilled by how far he’s come over the years. But of course, I want more. Having a few Asian American characters as leads out there is fantastic. But the real juice comes when you have many, many different Asian Americans in all different kinds of roles. Diversity within diversity is where the really interesting things happen, where you can get into deeper nuances of different experiences. In Totally Awesome Hulk, we got to do a hugely fun story a few months ago that starred six different Asian American superheroes, which I think was the biggest team up of Asian American heroes in mainstream superhero comics ever. And that opened the door to exploring some deeper points of bonding and conflict between these characters, the kinds of nuances that wouldn’t be possible to explore without that kind of diversity within diversity. It’s pretty exciting to be making comics at a time when that kind of thing is possible. With Mech Cadet Yu, I love that we’ve got five different Asian Americans in different key roles—in a variety of different ages, social statuses, socioeconomic backgrounds, and temperaments. Life is complicated and complex. It’s a blast working on stories that reflect that reality. Mech Cadet Yu #1 hits shelves tomorrow, August 2.